This weekend, I thought my house was blowing up. Legitimately. Somehow, a transformer exploded across the street from us and the explosion occurred just as I was turning off a light in my house. I heard a huge boom, saw super bright colorful flashes of light, and felt the house shake. “OMG did I blow up our house?!? !” I frantically yelled to Chris as I tried to determine the quickest way out. But when we opened the door, we realized it happened across the street and there was a small fire on the electric wires and another on the ground. We called 911, waited for the firetruck to arrive and thanked our lucky stars that not only was our house not blowing up, but our electricity wasn’t even out. I’m also thankful that my turning out the light had nothing to do with this turn of events. So, why did it happen? Well, I don’t know, but I do know that we saw three huge turkeys in our yard the evening before. And that our neighbor claims she saw a turkey roosting on top of the wires that night. Huh. This is seriously concerning, right? Turkeys are allegedly setting fires in my neighborhood and attempting to destroy homes. Needless to say, I required a glass of wine and lots of cheese that evening. Luckily, we went to celebrate Father’s Day at my sister’s house and enjoyed lots of wine and cheese, along with the company of the best dad in the world and my my fabulous aunt and uncle who were visiting. Mt sunday was redeemed. 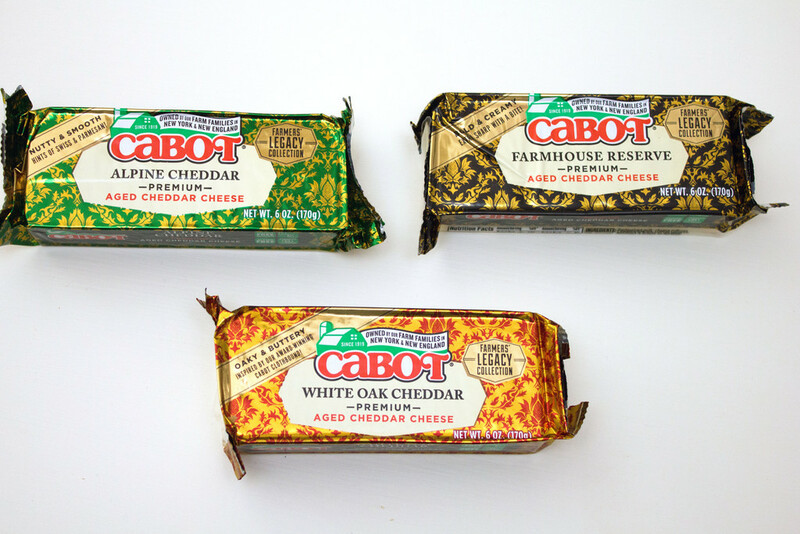 I’m lucky enough to be in Cabot’s Cheese Board, which means Cabot sends me cheesy treats on occasion. These three varieties of aged cheddar are my new obsession. For this recipe, I went with the White Oak Cheddar, one of my all-time favorite cheeses. Swoon. I used an entire block of it. So, you should know that my husband has an obsession with parmesan goat cheese crisps; the ones they make at the French Laundry. But more specifically, the ones from the French Laundry that our friend Jeff makes at every one of his and Kyle’s wine parties. Sometimes it’s a total embarrassment because Chris eats the entire platter of them within the first hour of the party. I’m pretty sure they have taken to hiding extras, so that Chris can’t find them. I should probably make them myself, but I just love seeing how excited he gets every time we go to a party at their house, so I want to keep that novelty alive. But I started wondering if I could do the same type of thing with cheddar cheese… And you can! Instead of just crisps, I decided to make cups and then I filled them with an avocado feta mousse. Because yum. 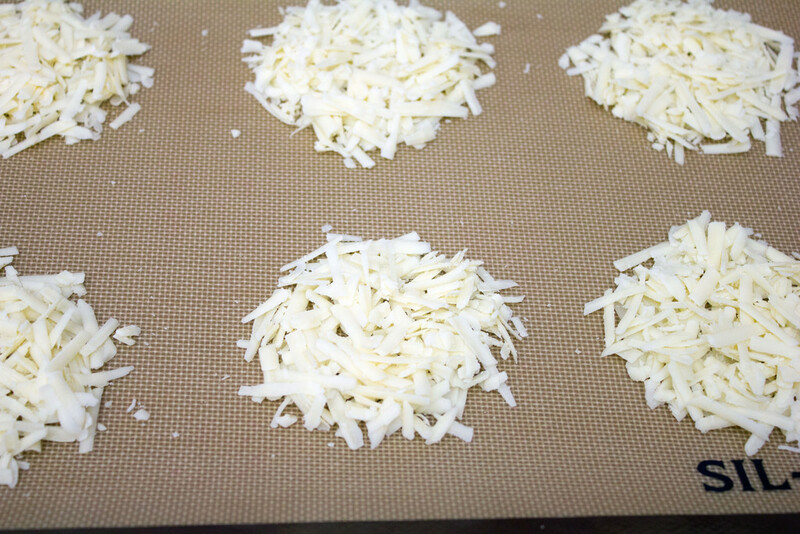 Basically, you make little circular mounds of the grated cheddar on a parchment or Silpat-lined baking sheet. Make sure they’re spaced at least an inch apart. 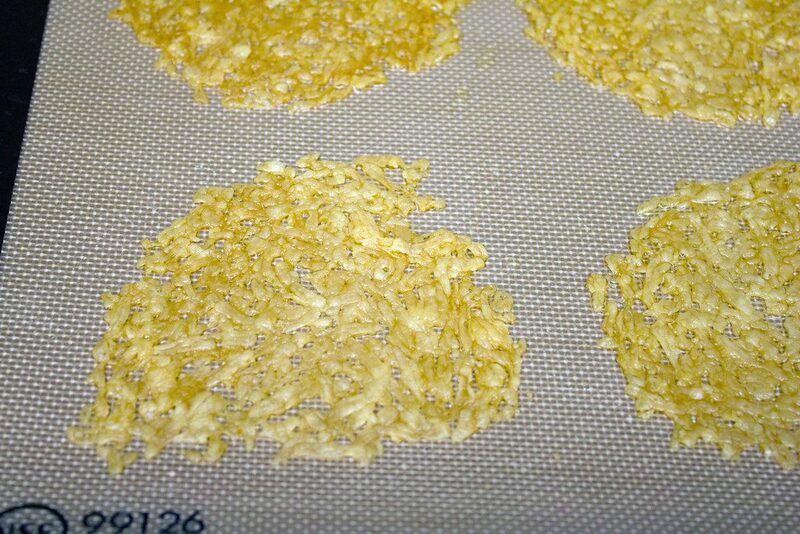 Then bake them at 350 degrees for about 8-10 minutes, until cheddar is flattening out and turning golden. Let the rounds sit for 30-60 seconds, until you’re able to pick them up with a spatula and place into a muffin tin. Timing is important now as you don’t want the cheese to be too gooey, but you also don’t want it to harden before you get it in the tin… And it hardens quickly! Let the cheese cups cool in the muffin tin before removing. I’d say these are a tad bit tougher to make than parmesan cups because parm is a harder and drier cheese, making them a little bit more ideal for baking and forming. But still, worth it!! The mousse filling is about the easiest thing ever! 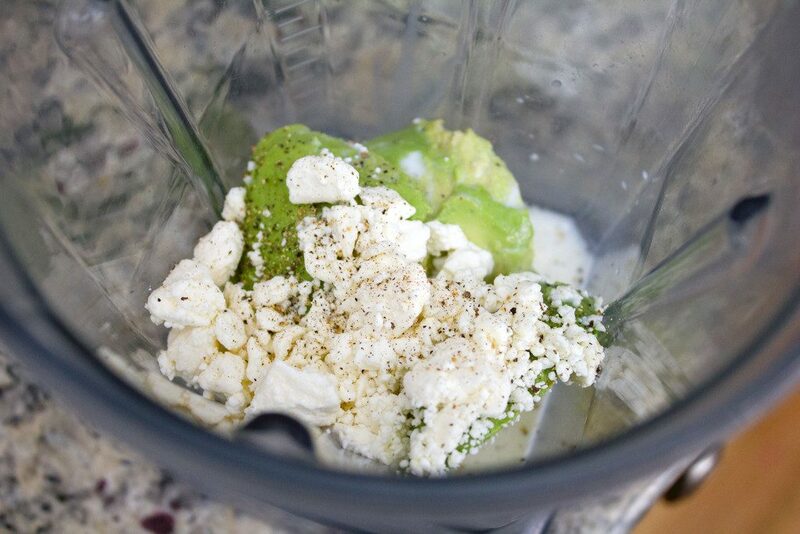 Just put 2 peeled and pitted avocados, 1/2 C crumbled feta cheese, 1 T freshly squeezed lime juice, 6 T milk, and 1/4 t black pepper in a blender or food process. Blend away until smooth and creamy! And then bake up that kale! Take 2 cups of kale and 1 1/2 T olive oil and mix them together in a bowl with a 1/4 t red pepper flakes and pinch of salt. Then spread the kale in a single layer on a baking sheet and bake at 350 degrees for about 16-20 minutes, until nice and crispy. Now for the assembly! 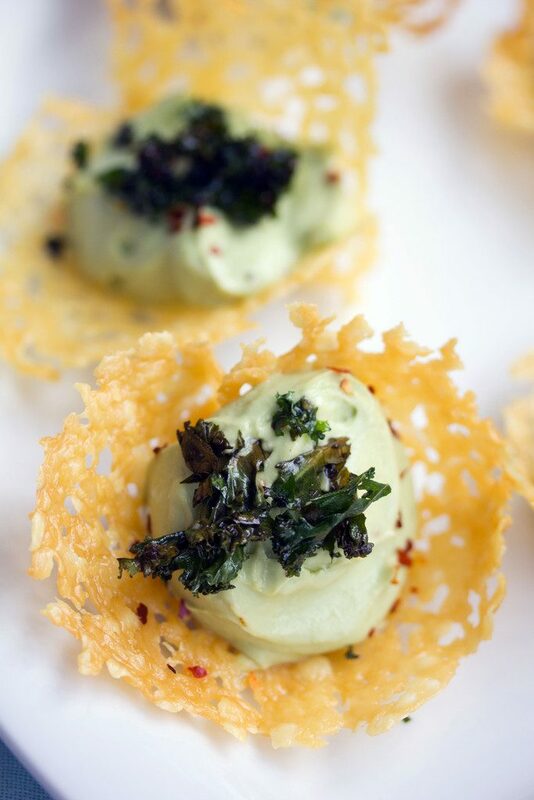 You can either pipe the avocado feta mousse into the cheddar cups or you can simply spoon it in. Just don’t forget to top with some crispy baked kale! I honestly think that if I could only choose a few foods to live on for the rest of my life, cheese, avocado, and kale would be on the list. I actually really, really do like kale. I mean, not as much as cheese, but I legitimately Googled, “Is kale addictive” the other day because I think I may have a problem. I crave it so much and eat way too much of it. I’m chalking that up as a good problem to have, but it’s kind of freaking me out. So, put kale in a cheese cup AND add in plenty of avocado and I’m for real swooning. Cheese cups!! Like there is one ingredient in those… Cheese. I can’t get over that. And the Cabot I used was the perfect amount of sharpness, which I think is pretty key for these cups! If you’re planning to serve these at a party, I seriously recommend making extra because you may have no idea how much cheese you’re able to eat until you start eating these. I also recommending drizzling a little lime juice over the top. While I don’t think these apps will be sitting around your party for long, the lime juice will give them a little protection from browning. It was definitely a mistake for me to learn how to make these. Too easy and ridiculously dangerous. What wouldn’t be delicious in a cheddar cup?? These cheddar cups could definitely help you overcome all sorts of bad days… Probably not a home explosion caused by turkeys, but lots of other stuff. They certainly make me pretty happy! What three foods would you choose to live on for the rest of your life? These cheese cups involve just one ingredient... Cheddar! 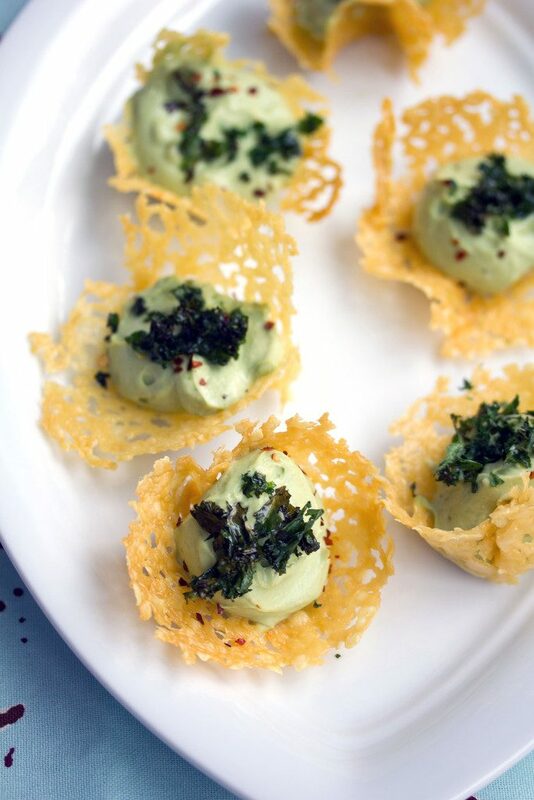 Fill them with an avocado feta mousse and top with some crispy kale for an absolutely perfect party appetizer. Pre-heat oven to 350 degrees and spray a small muffin tin with cooking oil. On a parchment paper or Silpat-lined baking sheet, scatter shredded cheddar in small circular mounds, spaced at least an ounce apart. Bake at 350 degrees for about 8-10 minutes, when cheese is just turning golden. After removing from oven, let sit for 30-60 seconds and then lift cheddar rounds with spatula and fit into muffin tins. 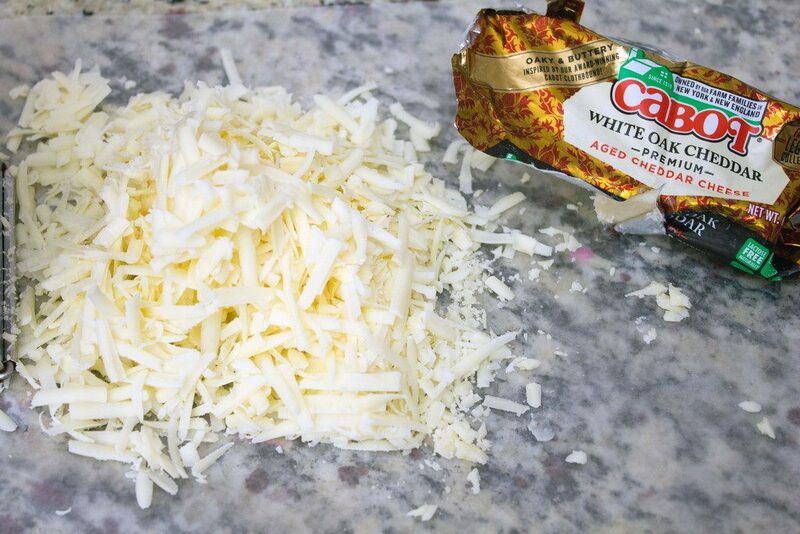 Press down to form cheese into cups. It's important wait 30-60 seconds before moving, so cheese isn't gooey, but then you must work quickly before it hardens completely. Cool completely and then remove from muffin tin. 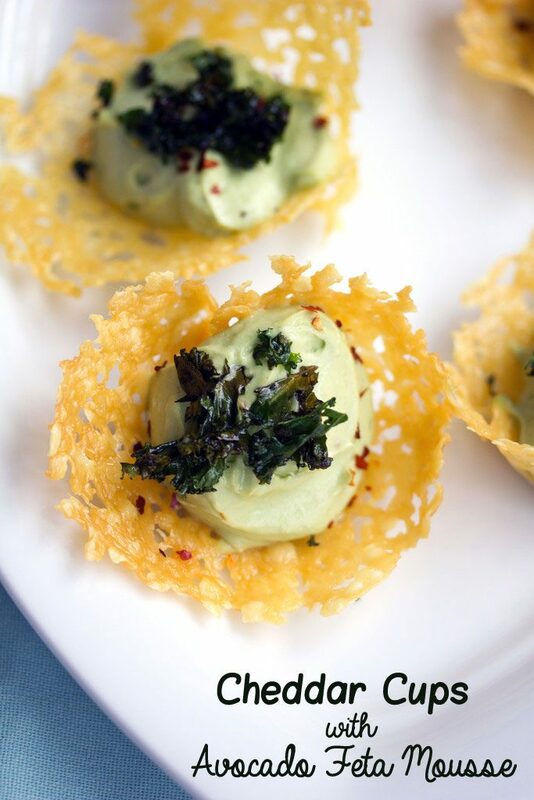 Spoon or pipe avocado feta mousse into each cup and top with crumbled baked kale. 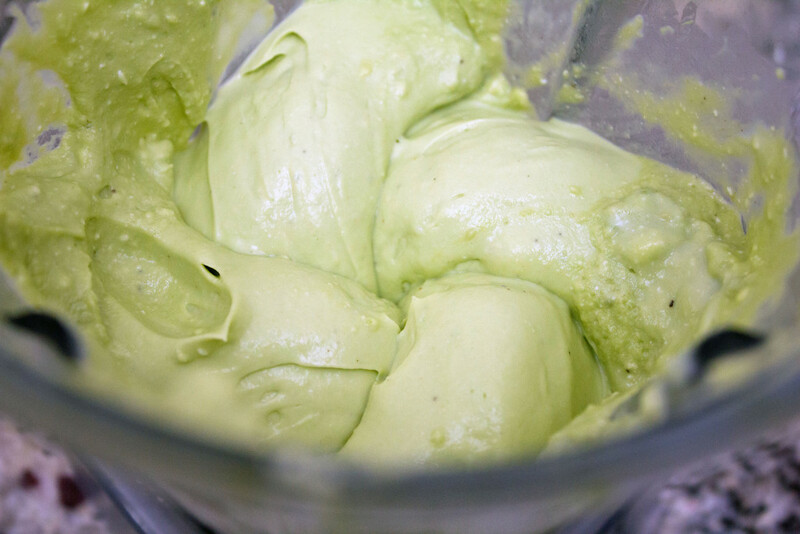 Places avocado, feta, lime juice, milk, and black pepper in a blender and blend until a smooth mousse is formed. 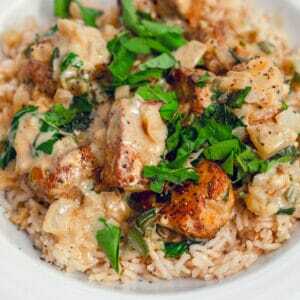 Place kale leaves in a bowl and toss together with olive oil and red pepper flakes, and salt. 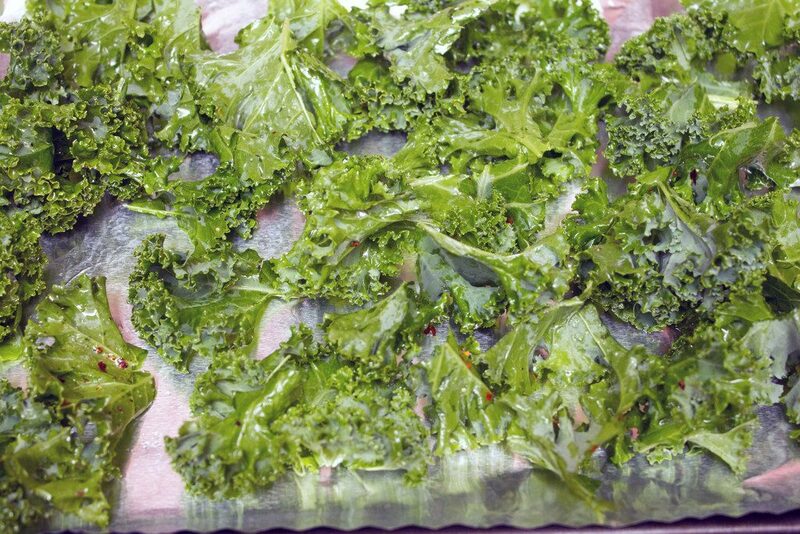 Once kale is coated, spread leaves in a single layer on a baking sheet and bake at 350 degrees for about 16-20 minutes, until nice and crispy. 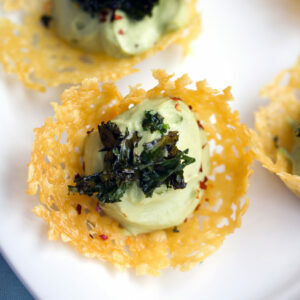 29 Responses to "Cheddar Cups with Avocado Feta Mousse"
Yum! That was literally my reaction when I saw these. Could gobble (turkey reference haha) these up in one go! Oh these cups look perfect, Sues! Give me all the cheese! 🙂 I love the avocado feta mousse, sounds delicious! Yikes, that’s so scary about the transformer… and TURKEYS might have done it!? Crazy! Glad everything is OK at your home. 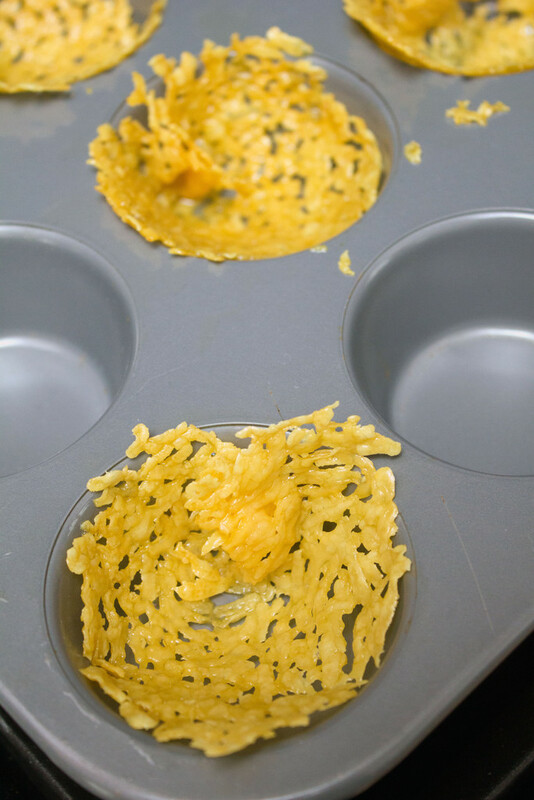 These cheddar cups are so creative and sound delicious! I am glad your house is safe! 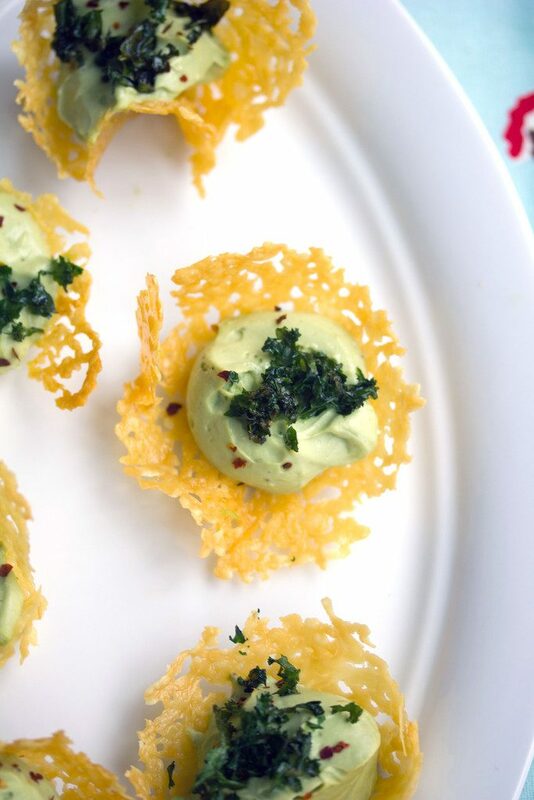 These little cheddar cups have me drooling – they look fun and creative. 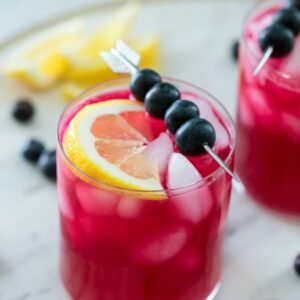 These sound/look so delicious! If I ever need an appetizer these are definitely going to be on the list! This is from the series turkeys against humanity lol make sure you stay away from them and just like in Gone Girl “Just don’t piss them off” 🙂 serve them the cheddar cups that didn’t turn out so good the first time, they will avoid your house! But, seriously, I love the combo you have here, very interesting and something that I have never seen before, and feta with avocado mousse, is music for my ears, just thinking about it makes me happy! These cheddar cups look absolutely delicious! That avo feta mousse sounds great too. Love the idea of topping with crispy baked kale! These look and sound so good! Love the idea of that avocado and feta mousse. Yikes, so scary about the transformer. Thank goodness your house is safe. These cheese cups look fantastic! Love the avocado feta mousse! Loving the cheddar cups! Such a great idea! And your avocado feta mousse sounds so fancy and delicious! Wow. These are the most beautiful things we’ve ever seen. Well done! We can’t wait to make them – YUM! This is such a creative idea, Sue! I have tried to make parmesan cups before and it was an epic fail, but I am totally willing to try these cheddar cups just so I can make this delicious recipe. That mousse sounds mouthwatering! These look incredible! I’ve actually never had the French laundry ones before (though I’ll take your word that they are addictive) but the cheddar ones you made are awesome. I love the addition of avocado and crispy kale! these are so adorable! What a great idea! I can think of so many fillings for cheese cups! I’m really glad your house did not explode. That woulda sucked. This is INCREDIBLE. I never thought of making mousse with these ingredients! And I love the cheddar cups. I’ve had crisps before, but not cups. This is great! omg these look amazing!! Such a genius idea!! That is so scary about the transformer across the street blowing up! These cheddar cups sound amazing! These are seriously SO pretty!! Amazing idea! I like that it’s just one ingredient!!! Okay, so I just wanted to tell you thalet I made them tonight as a trial run for brunch tomorrow and OH. EM GEE. AmAZing!!! Also, we did a batch with cute little curls of bacon on top (teeny tiny ones) and even my green-hating husband couldn’t put them down!! 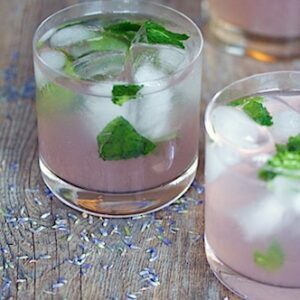 This recipe is addicting and wonderful! Can the cheese cups be made a day in advance and would they need to be refrigerated? 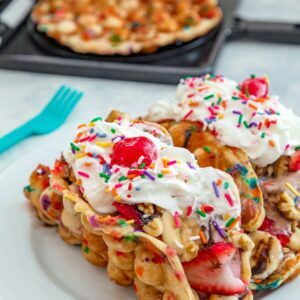 Recipe looks awesome and I plan on making for my wife’s birthday party. These cheddar cups with avocado feta mousse are so Instagrammable and adorable! It is very decadent, and the people in my office are happy today! Thx for sharing! 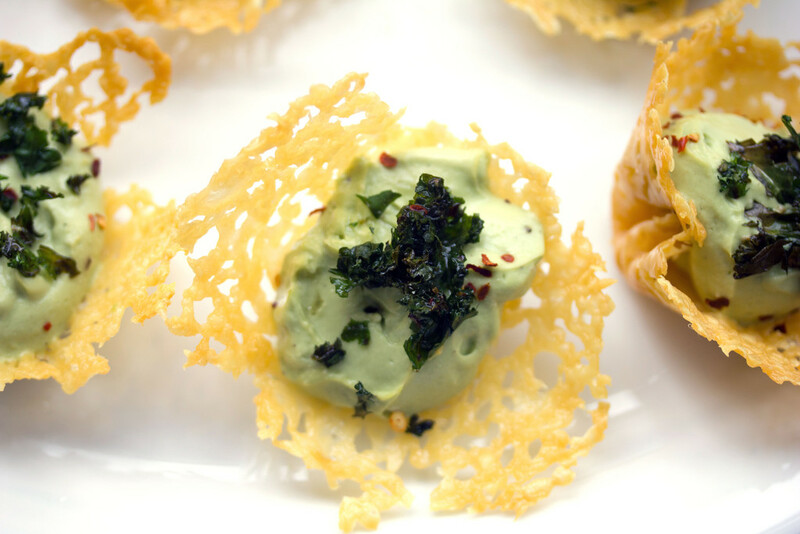 Really this would be special and great cheddar cups with avocado feta mousse recipe, Sues! Love healthy food! Thanks for sharing!